This set contains all you need to light a single car. We have a pair of fast flash headlights that flash together. A pair of simulation flash normal speed red tail lights. And a pair of independent fast flash lights for the top bar, choose from red one side blue the other, or both red or both blue. 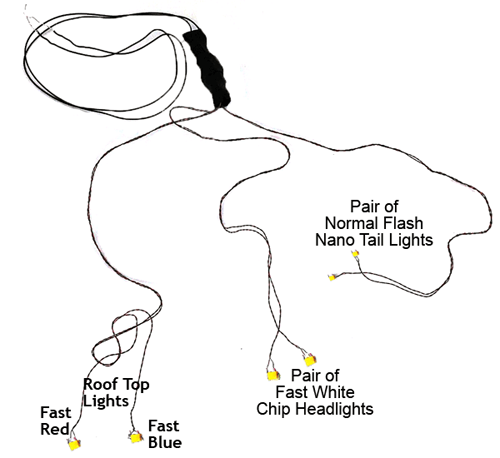 These lights make a great modification for you static cars! And the red/red light can make a great emergency vehicle for fire truck or ambulance. Here are the lights in an HO Police car. We went on the outside of the car with these fine wires. If you look closely you can see 1 wire trailing along the window tower. We could paint this car color and it should blend in well. This complete light set includes fast flash headlights, normal flash tail lights, and 2 lights for the top bar. All set up for 12-18 volt AC/DC. The lights are on very fine wire, so you can even apply the lights to the outside of the car, run the wires along the frame, and paint the wire to match the car colors. Lights are flat profile. Headlights and top bar lights are 3mm x 3mm tail lights are 1.6mm x 1.6mm. Suited to 1:87 scale or other small scales.